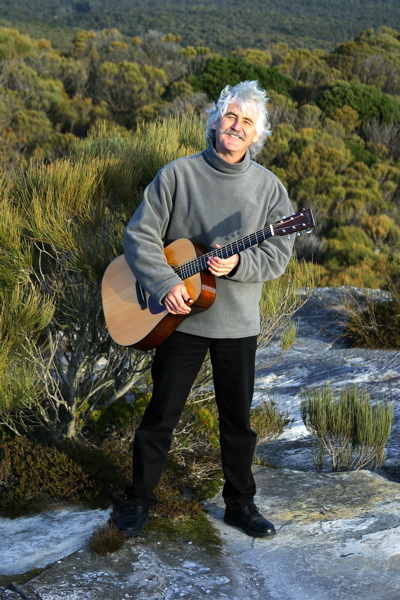 Nigel Foote has taught guitar in the Blue Mountains since 1983, and brings a wealth of experience to his students. Nigel is an accredited Conservatorium of NSW teacher who has taught for the Mitchell Conservatorium of Music in Bathurst and Forbes, as well as for schools in the region including, All Saints College and the Blue Mountains Grammar School. However, the vast majority of his lessons have been given privately at home in a warm, family environment. Nigel's guitar students learn how to master the same finger-picking technique employed by many of the world's finest singer-songwriters and guitarists - a technique based on the traditional folk-blues or country-blues styles that were developed early last century by players such as Blind Blake, Mississippi John Hurt, Reverend Gary Davis and Doc Watson. Paul Simon, Arlo Guthrie, Eric Bibb, Chris Smither, Tommy Emmanuel, Kate Wolf, John Butler, Harry Manx, Bruce Cockburn, John Prine, Don McLean, John Denver, Gordon Lightfoot, Judy Collins, Leo Kottke, Rick Ruskin, Mike McClellan, Ralph McTell, Kieren Kane and Kevin Welch – the list goes on..
All these sublime singer-songwriters and guitarists share something in common - they all learnt how to finger-pick! They all learnt the same basic technique - Nigel can show you how. These essential techniques enable students to develop a beautiful finger-picking style, learnt through a graded series of original and traditional tunes that are not hard to master, provided that the basic techniques have been thoroughly learnt and a little practice is done each day – therein lies the secret! Nigel also teaches the simple, yet effective strumming patterns used by countless artists including Neil Young, Paul Kelly, Gillian Welch, Cat Stevens and Pete Murray. "Foote's Fabulous Finger-picking Fundamentals for Folk-Guitar", is structured on building a really strong foundation in finger-picking technique, empowering the student to develop into a fine player as the years roll by. Whether you're an absolute beginner or a professional player of other styles who wants to get into finger-picking, you will find the course simple to follow, fun and informative. "Foote's Fabulous Finger-picking Fundamentals for Folk-Guitar", will also serve as an honest companion for anyone wishing to embark on the singer/songwriter journey. Rather than simply following the usual practise of charging in advance to cover a missed or cancelled lesson, Nigel prefers to offer his students the opportunity of doing a catch-up lesson. That way, students receive the lesson they pay for, develop more quickly as guitarists, and Nigel is able to run his business in an economically viable fashion. This arrangement minimises the negative effect that missed lessons have on a student's progress. Having continuous, regular lessons is the best way to develop as a guitarist, and as Nigel does everything possible to make himself available, he encourages his students to show the same commitment. If a school-age student has multiple missed lessons, one of those lessons may be carried over to the school holidays – the others must be caught up during the term. School holidays only apply to school-age students and to adult students who have weekly lessons – not to adult students who have fortnightly lessons... "I have found that fortnightly students who take a break during the school holidays (except at Christmas) often struggle with that stop/start approach, so I don't conduct my lessons that way anymore". "Although arranging everyone's catch-up lessons is a bit of a juggling act for me, it is the best and fairest system that I have found in over 33 years of teaching... and definitely results in faster progress for my students. Martin Foote has joined the team! Martin has served an apprenticeship in teaching finger-picking guitar styles with Nigel and began teaching in 2011 teaching teenagers and adults. Martin has also taught for the Waratah School of Music, Katoomba. Martin attended Tommy Emmanuel's Guitar Camp in Sydney in 2013 and again in 2014 where he performed Classical Gas on stage with Tommy! Besides teaching Nigel's guitar course, Martin offers advanced guitar students the opportunity to learn some of Tommy Emmanuel's arrangements – tunes such as: Classical Gas (Mason Williams), Here Comes the Sun, Day Tripper, Lady Madonna (Lennon/McCartney), Windy & Warm (John D. Loudermilk), Blue Moon (Rodgers/Hart) and Tommy's own tune, Countrywide. Martin is currently working on John Lennon's Imagine and George Harrison's While My Guitar Gently Weeps. Learning to play a musical instrument requires daily practise – 30 minutes a day should be thought of as the minimum amount (20 minutes for children under seven). It is better to do a little practise every day of the week, than four hours on Sunday. Practising immediately after a lesson is highly recommended! By far the biggest hurdle in learning to play a musical instrument is mastering the will to practise. It's like running around the block to get fit, or watching what we eat to lose weight – it's a daily thing and quite hard to do consistently until one gets into the habit. Take a positive approach – instead of saying to yourself, "I have to do my practise" (which sounds like work), say, "I am going to play my guitar" (which sounds like fun). Leave your guitar out of it's case (in a safe spot) so it's not out-of-sight, out-of-mind. You will pick it up more often than if it's in it's case. Who cares if the strings don't last as long, or the instrument gets a slight scratch – do you want to become a guitarist or the owner of a mint condition guitar? Play it, play it, play it – wear it out and have it repaired or buy a new one – the world is full of guitars and there is one out there with your name on it! "Parents please note: Children need to be encouraged to practice every day. I have found that quite a lot of parents think that their child will do their practise without being asked to – an exception to the rule. Children simply do not have the discipline to practise every day – it's an unrealistic expectation that parents need to be aware of from the outset. In my experience, the children (and teenagers) who do best are the ones who are lucky enough to have parents who are consistently firm about practise. There are no short-cuts – there is no other way – practise must be done if students want to play well. It's a lesson that can also have a far-reaching effect in other aspects of their lives. Golden Rule: No TV or computers unless guitar-practise has been done. It works – try it! As parents we must learn to be firmly consistent with our children about rules. I know how hard it is – I had three teenage boys (they've grown up now). When my boys wouldn't co-operate, I simply removed their computer keyboards while they were at school and didn't give them back until practise was done. They didn't like it, but it worked– and their guitar-playing progressed in leaps and bounds!" Nigel has developed a reputation as an extremely dedicated teacher – one who nurtures his student's ability and confidence with the knowledge he has gained through having given over 20,000 guitar lessons to people of all ages. Some students come for lessons for a short time and some for a long time. As the years have rolled by, Nigel has found himself giving lessons to the children of previous students, and in one remarkable case, three generations of the same family! Besides being a professional guitarist, Nigel is also an accomplished songwriter who has won a number of songwriting awards for his work (see Nigel Foote – Reviews/Awards). Nigel's second album, Home By Dark, is available from iTunes, Amazon or the Folksinger Shop.